Glomesh is an international brand that makes these instantly recognisable ‘chain-mail’ handbags and purses in white, silver and gold. The company was founded by Hungarian immigrants Louis and Alice Kennedy in Bondi, in 1958. The company continues today, without much variation from the original design ideal. I am not a handbag person – BUT my sister is. She has a thing for Glomesh. 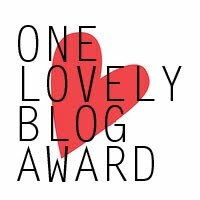 It’s the tactile and blingy nature of the bags –a reaction she shares with many. Naturally I support her in her Australian-made ideal. This is a very early purse- in gold- which has an internal label: “GLOMESH, Made in NSW, Australia”, which marks it as such. A few of the gold plates at the base are worn and a bit bent, but the purse is entire and its lining is intact. Welcome to 2017. And welcome to my retro ideal. This is a fantastic bar tray, featuring a rather [re-touched] photograph of Melbourne in the 50s. Oh! The glamour! 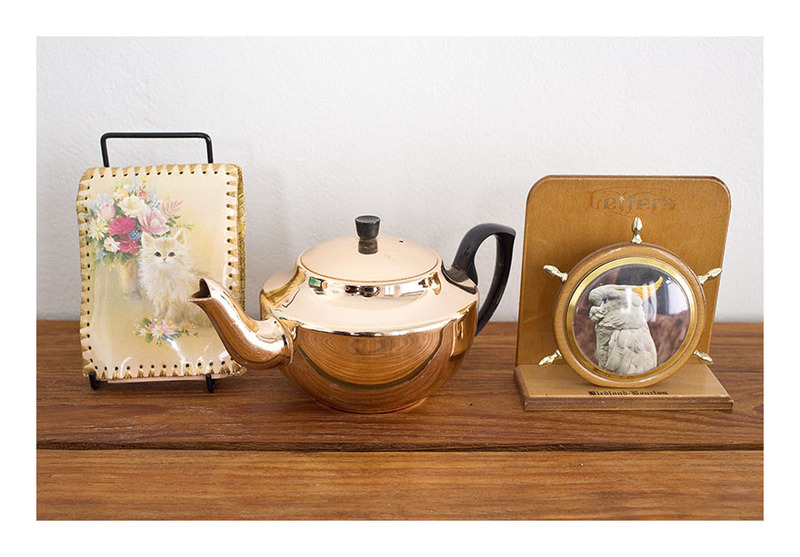 And a pair of Glamaware anodised aluminium gold teapots, never been used. More glamour! The handles and knobs are bakelite. The anodised aluminium is gold! Bling and functional- that’s my kinda 2017. Welcome in 2017 with some bar ware, and some good ol’ fashioned tea ware. Best of both worlds! When too much kitsch is barely enough, this wonderful souvenirware Bambi is gilt, has a thermometer AND a vase/pen holder. Bambi vases were made and hand painted in Japan and then shipped to every corner of the globe where the locality’s name was added; this one is marked Mackay – a regional town in Queensland. The thermometer rather idealistically records temperatures up to 50 degrees Celsius but then presumably the Bambis were also shipped to Equatorial Guinea. The love for Bambi in the 50s knew no bounds! And I’ve tested the thermometer- it’s pretty accurate. 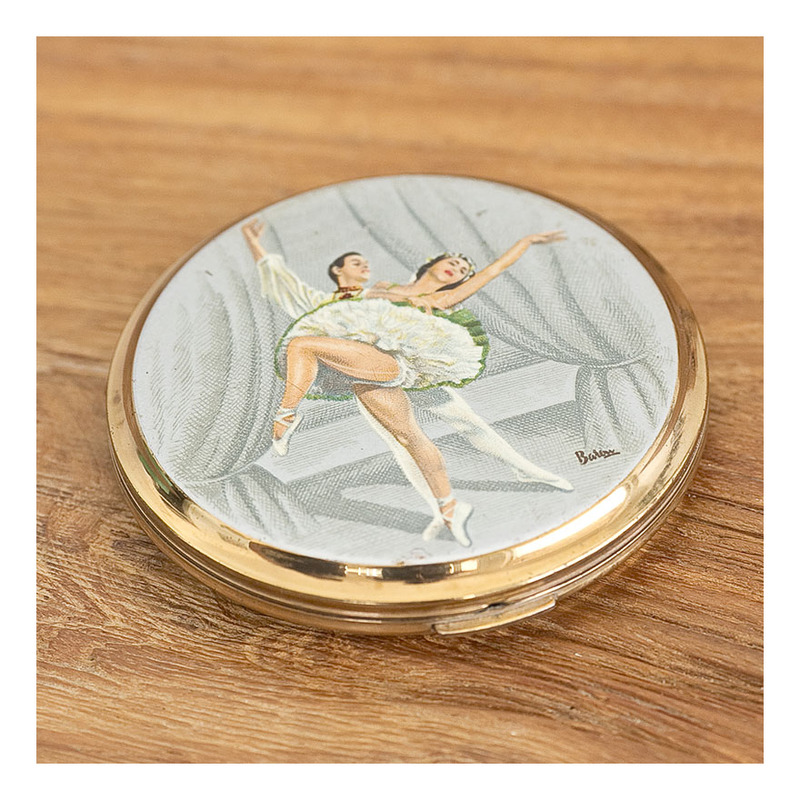 This compact is a beauty- in fantastic condition- and featuring Alexandra Danilova and Frederick Franklin dancing in Coppelia on the front. [This information thoughtfully provided on a label inside the compact.] The compact is gold-coloured chrome and comes with mirror, gauze and puff intact. The compact is made by Stratton who specialised in gold-toned compacts in the 50s and 60s. Wembley Ware pottery operated from 1946 to 1961 in Perth, Western Australia – and produced a “Fancy Ware Range” featuring Australian flora and fauna. I particularly like this merino dish because it’s an early example of advertising ware AND Australiana. The Golden Fleece service stations operated across Australia from 1913 to the 1970s- and you guessed it- their logo was a gold merino sheep. Golden Fleece was the first single-branded service station, with a bright yellow sheep atop each petrol pump. The sheep was modeled on a certain ‘David of Dalkeith’- a Royal Agricultural Show winner in 1952. I know all this due to a) Wembley Ware being highly collectible and having a number of fan sites – as well as its own facebook page- and b) Golden Fleece memorabilia is also very collectible and having a renaissance of sorts at the moment. The dish is in great condition; zoom on the image and see the shiny gilt of the merino! 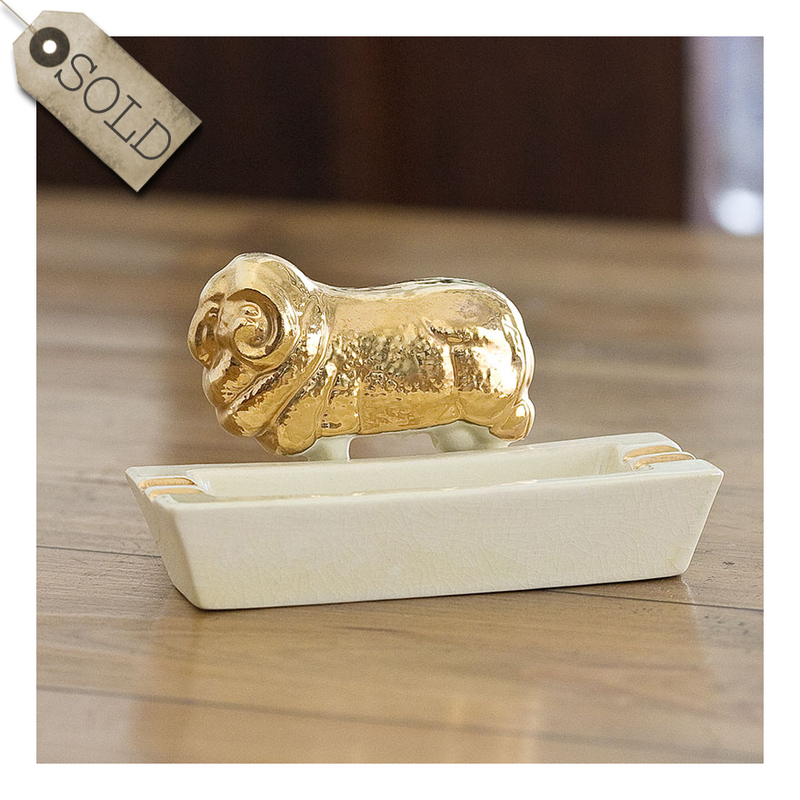 I have seen the same dish for sale an antique shop for $165- but for you, gentle reader- the Golden Fleece dish is for sale for $AUD95. Following on from my last post in which I extolled the virtues of Towerbrite anodised aluminium, here is another Towerbrite teapot, surrounded by a hand-laced kitten notebook and a timber letter holder featuring a cockatoo. The three work well together as they are all about gold/yellow tones, are roughly the same size and all feature simple massing/shapes. And all three have a lovely 50s kitschiness. Each element is in good working order, still fit for purpose- and when not being used make for a interesting display. 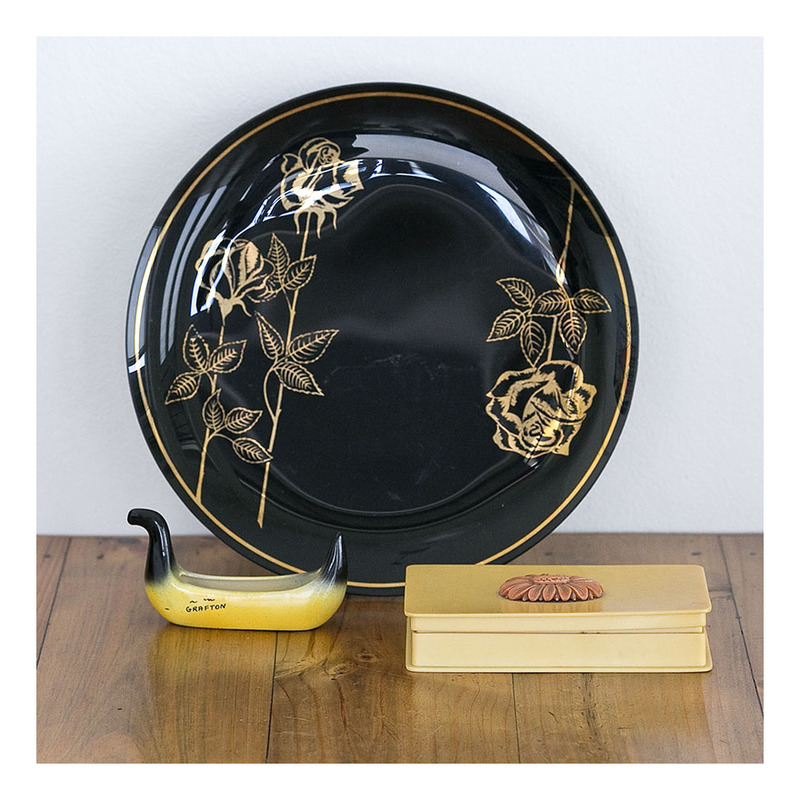 One can never have too much kitsch. How shiny and lustrous are these anodised aluminium pieces- and how beautiful the bakelite handles! They certainly live up to their name- Towerbrite- and I particularly like the expressed handle connections- very modernist. 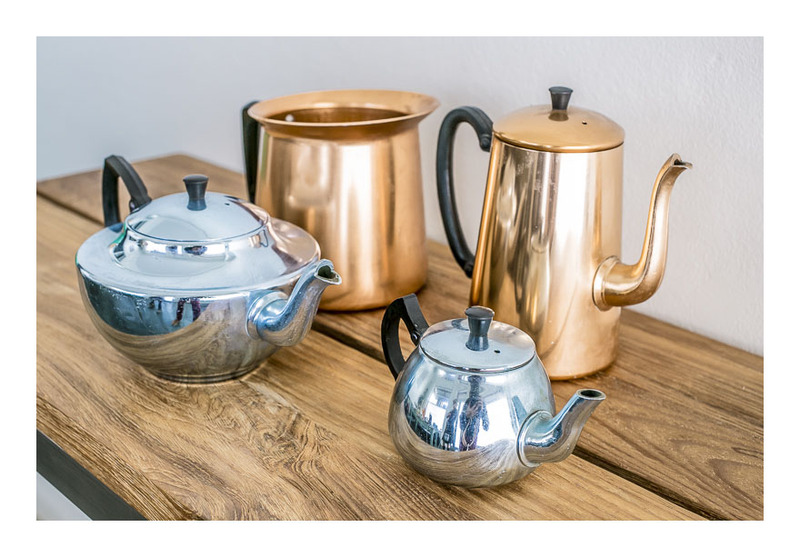 I first became enamoured with anodised aluminium whilst visiting a trendy new cafe in Newcastle- they had a long line of various teapots of all colours along the top of a countertop that looked fantastic. This goes to prove my theory that more IS more- and one should collect as many anodised items as one can. The blue teapots are stamped with “stainless tableware, made in Australia” while the gold set of coffee pot and water jug are unmarked. All are clean inside- no tannin staining- which suggested they are still waiting for a brew. And all are in good condition, no nicks or scratches. When too much anodised aluminium is barely enough! Now, I know what you’re thinking…might be just a little too excessive this time. But oh contraire! The atomic age of anodised aluminium is again coming into its own. 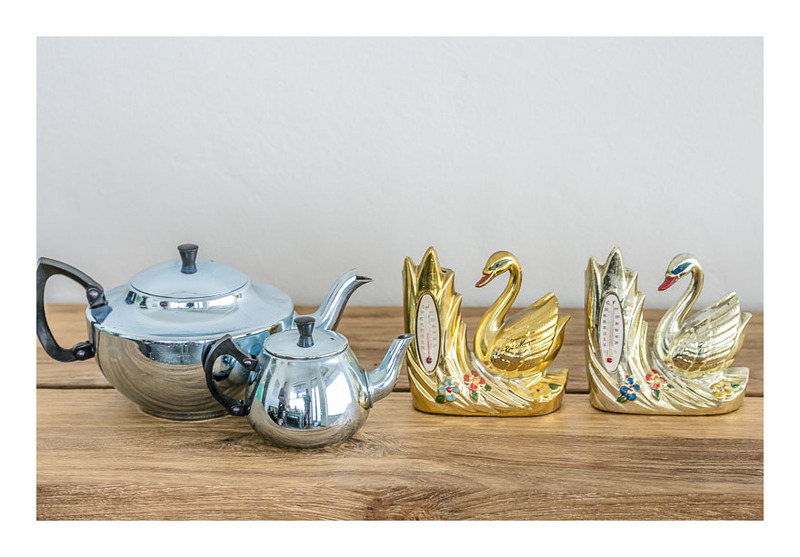 The souvenirware Swans were made in Japan and shipped to every corner of the globe. Seemingly swans come from everywhere…but in the case of Australia- yes- we have both white and black swans as native birds. Anodised gold ones are a little rarer…but now you can own a pair! And tell the temperature.